Back in 2011, a political movement (the Occupy movement) was spawned whose goal was to address the income and wealth inequality among the US population (which eventually spread worldwide). Their slogan was “We are the 99%,” referring to the fact that a large amount of the wealth was concentrated in 1% of the population; data from 2007 show that 24% of the wealth in America was held by 1% of the people. While this fact is something that needs to be taken seriously, my goal here isn’t to make any political statement. Instead, I want to continue a theme emerging in my recent posts about humans’ inability to easily comprehend big numbers, probability, and large scales. In an earlier posts, I talked about how folks have an inherent problem with statistics, specifically involving the lottery, and how the scale of the universe is practically ungraspable. Most people probably didn’t realize the wealth distribution inequality pointed out by the Occupy Movement was so drastic because, again: big numbers. Here in America, we’re used to a certain standard of living. Of course there is poverty, but even the poor experience a lifestyle that is relatively high compared to the rest of the world. Many people in America might believe that an income of $34,000 is pretty low (borderline poor to some), but they might not realize that if your earn that much or above, you’re in the top 1% of wage earners in the world! We have a skewed sense of reality in the US and just don’t realize how many people there are out there, and how many live in poverty. (More than a third of the world’s population lives on less than $2 a day.) 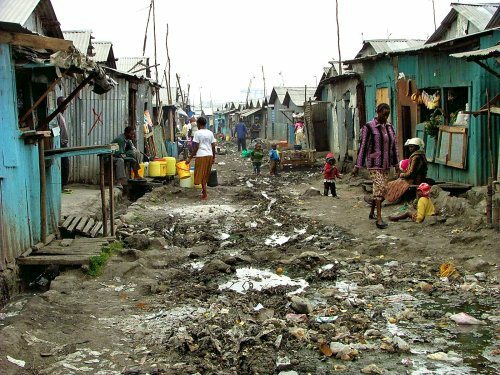 Real poverty… So, if you take the entire world population and pick someone at random, you have the highest odds of picking someone living in poverty. Remember seeing those commercials where a child is looking up at you with sad eyes and a distended belly laying in filth with flies all over their face? Enough of socioeconomics, time for some geography. Let’s look at the Earth as a whole. What does it look like from space? What would it look like to an alien who has never seen Earth before and has just discovered it? If an alien race sent a probe to Eart h (not unlike the robots we sent to Mars) and landed on a random spot, chances are that it would land in water; not in a populated city, not in the forest, not even on land! The ocean is the most common ‘landscape’ we have here on Earth. 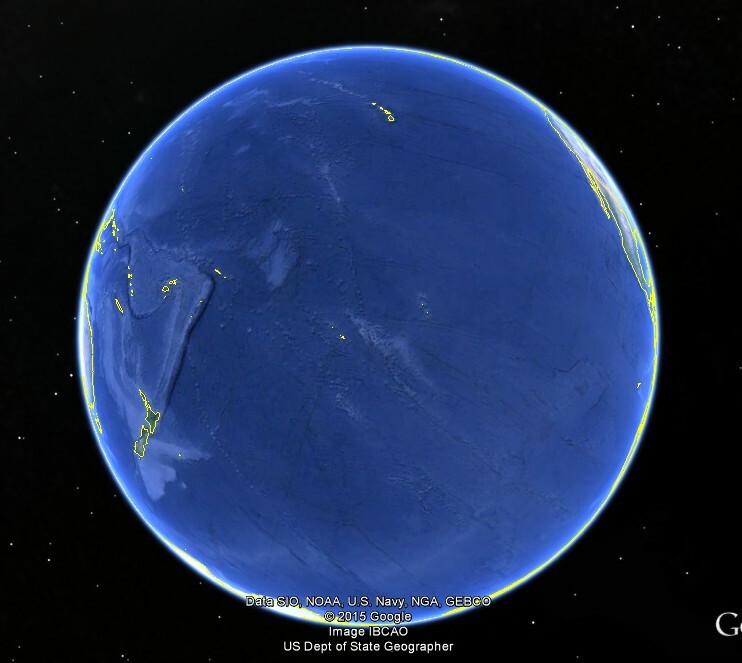 Check out this image I grabbed from Google Earth; it shows a view of the south Pacific. Other than a few smatterings of islands, it’s all water! (Side note: Magellan is a crazy, badass.) You live in an uncommon part of the globe. I think it would benefit us all to step back and think about this stuff from time to time. We get so involved in our daily lives and surroundings that we get disconnected from the rest of the world. That’s one of the reasons I love astronomy so much; it really helps put things into perspective. Viewing the Earth from even a short distance away like the Moon can really illustrate how insignificant* we all are; from that distance, you can actually hide the entire Earth behind your thumb. If you think your day is going bad, zoom out to stellar scales and your problems literally disappear. *I said ‘insignificant,’ but that doesn’t mean ‘not important.’ We’re all extremely special and unique… more on that later. 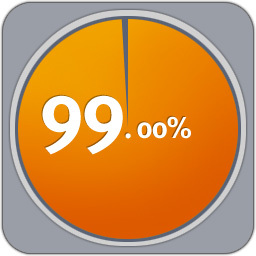 I was just relaying to Brian last night what I heard on the news about how the richest 1% of the world’s population equals the rest of the 99% of the world’s wealth. But this news story had the slant basically about socialism and how the world’s wealth should be evenly distributed.